First off, I'm glad to see you back, Doc. The world needs men like you doing what you've done for as long as I've known you. We are enriched by whatever measures of your presence we're blessed to receive. In case you didn't read the by-line, this is Jonezy. I spend most of my time lurking these days as my limited internect access (and even desire to use it) dwindles more with each passing day. I miss y'all, certainly, but it's hard for me to balance my life while remaining connected so I mostly step back from online engagements that aren't business-related. Leader: the person who leads or commands a group, organization, or country. With 'leader,' there is a notable absence in the description of anything to do with the leader's relationship to, or membership within the group, organization, or country being led. This, I think, is *key* to establishing the demarkation in this 'exemplar vs. leader' dichotomy. Put simply: a leader doesn't need to possess any real affinity with the people they are leading in order to be an effective leader of those people. This is why businesspeople are generally good at pretty much any type of business, regardless of what the business happens to be (manufacturing, service, import/export, tech, etc..). You don't have to be a great IT professional to marshal a team of IT professionals into producing a competitive product and carving a niche out in the marketplace. Business is business, because humans are humans and leadership is leadership. Alex Rodriguez was, without question, one of the finest baseball players in the history of the sport. Whatever you might think of his personality, or of his appetite for gummy bears, he was easily one of the most potent bats the game has ever seen. There weren't fifty players better than him in the history of the game. Heck, there might not have been twenty, and Fangraphs has him #13 on the all-time WAR leaderboard. By any objective, fair-minded measure, he was an exemplar of his sport. At his peak he did *everything* at a superior level, and his megawatt smile was proverbial icing on his face-of-the-sport face. He was showered with money, both literally and ironically (remember his return to Seattle after signing with Texas? ), and was a darling of the baseball world who reveled in his seemingly inevitable march on the all-time home run record. He was unstoppable. The player of his generation. And everyone knew it. And here's where the matter begins to teeter on the border outlined by the 'exemplar vs. leader' dichotomy. To my mind, there is little question that Alex Rodriguez was more successful than every player he ever took the field alongside. Use whatever metric you choose to employ in countering my claim, but I think you'll find the suggestion is (somewhat surprisingly, at least it was to me) irrefutable. So why, then, did he play second (or third?) fiddle to men like Edgar, Junior, Buhner and Wilson during his time in Seattle? Then after moving to Texas, he sat solidly behind Palmeiro, Juan Gone, and possibly even Pudge on the leadership ladder. The final nail in the coffin came before he'd ever suited up for the Yankees. Upon his arrival to New York, it was made clear even before his private jet's tires cooled off from landing that he would be deferring to Jeter by moving to 3B instead of making the more obvious move of Jeter to 3B or the OF. A-Rod was the superior defender of the two at SS, and his bat was considerably more valuable. Jeter's legs, meanwhile, would have made for a butter-smooth transition to the outfield. It *seemed* obvious that A-Rod would end up at SS while Jeter moved off to accommodate him. Because not all exemplars are leaders, and not all leaders are exemplars. But if you ever happen to get both in the same person, you'd be a fool not to install that person as the beating heart of your organization. Rafael Palmeiro was not A-Rod's equal on the field or in the box. Neither was Jeter. Surprisingly, neither was Jr. when all was said and done, and trying to make the case that Edgar was somehow a 'better baseball player' than A-Rod is a pretty laughable assertion. He *did* do some things better than A-Rod, but on balance you'd take A-Rod several rounds above 'Gar in the all-time fantasy draft and you'd never question the decision. But a guy like Edgar, whose leadership was improbably manifest in his actual performance (remember all those long AB's in the middle of a game where the opposing pitcher was mowing the M's down? or the opposite-field groundballs to advance the runners instead of gripping-and-ripping for glory? ), endeared himself to the fans in ways a guy like A-Rod never could. I think much of that endearment should be attributed to his leadership, which humans have been conditioned by tens of thousands of years of social development/evolution to recognize at a glance. After all, follow the wrong leader (even if that leader's got enough charisma to light up Vegas and the physical prowess of Conan the Barbarian) and you have a greater chance of dying than if you followed the right leader. Look at the NFL and you can see how the 'leader vs. exemplar' dichotomy is often much, much clearer than it is in baseball. How many teams have special teamers who serve as player-coaches, but take few (if any) snaps on offense or defense? It seems like *every* team has one or two of those guys on the roster to start each season. And on the other end of the spectrum are the perpetually mercurial, prima donna wide receivers who, like A-Rod, are better at what they do that everyone else on the field. But how many WR's are also considered legitimate leaders in their own rights? Larry Fitzgerald comes to mind, and I'm sure there are others, but you get the point I'm making: exemplary athletic ability does not confer upon someone the mantle of leadership, even among fellow athletes. Russell Wilson is the rare combination of leader and exemplar, which is a huge part of why he's beloved (both locally an nationally). Is he the best player on his team? Most seasons of his career, the answer probably would be 'no.' But he's still the undisputed Team Leader, and I think we all know that he earned every bit of that mantle. Alex Rodriguez was, perhaps, the most striking example of an exemplar who was not a leader that we've seen in MLB's recent history. He did *everything* on the baseball field better than *everyone* he played with. He was a baseball god. Full stop. He was also unable to ever, for a single season on any of the three teams he played for, ascend to the top of Mount Olympus and take charge of his fellow sportsmen in the same way that even a relatively lowly player like Dan Wilson (who we all love and appreciate) could do year after year. Heck, even Jay Buhner was commonly considered a team leader with his ongoing hijinks and through-the-front-door approach. Exemplary performers, on whatever field they choose to compete, are automatically regarded more highly than their fellows. It is my (not altogether uncommon) opinion that the concepts of 'merit' and 'leadership' continue to drift closer toward each other in Western societies precisely because we believe in fairly compensating excellence. We cannot shovel money quickly enough at people like Zuckerberg and Bezos for having contributed to our daily existences so significantly, but I think that, like with our athletes, we'd probably be wise to recognize that their exemplary performances in the marketplace should not automatically confer the mantle of leadership, or even significant quotients of authority. That isn't to say that being mega-wealthy negates their potential for leadership, just that they are not fundamentally the same thing or are even linked to each other. Pay them their money, as we paid A-Rod his, and be glad for their contributions to your overall happiness. But don't ignore the examples set by our hometown ball clubs when they make perfectly clear that even 'meatheads and jocks' know the difference between an exemplar and a leader. Even if they don't eloquently verbalize it. You did what I have done dozens of times myself: put it in the "home" domain rather than the "baseball" domain. That makes it invisible to those who have bookmarked the latter. I went in and added the 'baseball.seattle...' domain. Does that fix it or should I delete and repost? It is interesting to me that our colleges now routinely offer PhDs in “Leadership Studies.” There is certainly an “It” factor that is difficult to break down, but you know it when you see it. Not a direct reply to your comment, as such, but whenever I hear about the concepts of 'business' and 'school' (or, in this case, 'leadership' and 'school') I'm reminded of the running jokes in the 1980s and 1990s about the utter futility of an MBA when it comes to breaking into the business world. Some things you *must* learn in a classroom. Some things you *can* learn in a classroom. And some things you *cannot* learn in a classroom. But whether or not leadership is something that can be cultivated, or even comprehensively quantified via academic study, you're dead on when you say that you know it when you see it. Miss a lot of the people you would want them to cover. If Dipoto says Kelenic is the perfect exemplar here I take it to mean he wants other players to rest, eat, exercise, video, train, talk to others, take advice, use social media and act in public similar to him. An exemplar is not someone who uses worse process to still get great results. They're the model, the ideal to aspire to. They do things the way you want all your guys to. The most specific definition for exemplar is "something to be copied." The best I can think to cover the remainder would be workhorses but even that could be split into something like race, plow, palfrey and warhorse. I find it hard to cover everyone without some less flattering connotations. Reading the description of Alex Rodriguez I think Peerless or Premier fits better. HoF play seems to work. Exemplary has been stretched to also mean closer to that except in law where it means "serving as a warning or deterrent". Still as a model, though a negative affiliation. I don't think ARod was quite exemplar anyway. and there are some that it infers unproductively. It's a problem inherent with the written word: precision is nearly impossible since words are essentially ranges of possible meaning. I like your 'Peerless' amendment, but it also undoes the entire dichotomy to my mind since it's not a term that gets much usage in common parlance. But the cluster of words including 'peerless', 'exemplary', 'supreme', 'aspirational model', and 'ultra-successful' I think correctly describes what I'm talking about: someone who is better at what they do than anyone else in sight. Your hypothetical invokation of 'exemplar' re: Kelenic is a solid point, as well. When third parties are holding up what they consider to be desirable behavior models, they'll invariably focus on just the bits they want to focus on. So even if Kelenic does all the things you list at an 'exemplary' level, but comes up short somewhere else in a technical department, there's still a disconnect between wanting players to emulate someone like Kelenic for his off-the-field routines and conduct, compared with players *choosing to follow* Kelenic because he strikes a resonant cord deep within the social fiber of their humanity. Urging emulation is an educational or instructive method. Leadership *can* involve that, and usually does, but sometimes leadership is more about marshaling and directing. An extreme but illustrative example might be FDR, who was in a wheelchair and therefore unable to actually *model* many of the behaviors he *commanded* society to undertake in order to work out of the Great Depression. Again, leadership isn't *necessarily* linked with exemplary performance. Sometimes it's rooted in demonstrated success (based on coherency of vision and planning) and made possible by extreme personal charisma. Barack Obama would seem to be a good example of this: his political career was not anchored on much beyond a history of political success (from the community organizer level all the way up to the US Senate), a keen mind, and enough charisma to light up the night sky. He had no experience in business, and yet we handed him the reins to the species' most powerful economy. He had no military experience, yet we gave him the nuclear launch codes. Leaders don't *have* to be exemplars in order to become leaders, or even to be great leaders. I just think exemplar is the best word for the top example. The points are still the same and I agree with what you're saying. Dee saying that Ichiro was partially responsible for his 2015 Batting title tells me Ichiro has turned himself into all of those. And he wants to coach here? Great article Jonezie. Like you, I have pulled way back on my online social time. I even pulled the plug on Facebook last year despite the fact that it put me out of touch with dear family and friends. Re: your article, the fundamental assertion is surely spot on. And I like how you pointed out how our society has drifted towards conferring leadership on "successful" people, with "success" being defined in ways that work best in business, but not necessarily in the social and political realm. A "successful" actor or actress shoots off their mouth on a social or political subject and they often prove this point. There is a real value in politicians, despite how often we pan them. The most successful leaders are politically and socially attuned, not just to their core constituency (that's EASY! ), but to the broad currents in which they swim. They must navigate between the shoals of compromise, the art of the possible, and determination to achieve some worthy goals for the good of all. One who can only compromise is only helpful to a point. They can help the wheels turn, but they cannot set a worthwhile direction. If leadership becomes too much characterized by compromise, it becomes lifeless and utilitarian. But groups and nations quickly grow weary of utilitarianism when it inevitably stagnates. At that point they turn to leader who will throw bombs and break things up. We live in a society where so many are focused on breaking things, and I have to admit the prior years of wimpy leadership probably made this necessary. And when leaders who break things have run their limited course, we need quality, trustworthy leaders who can rebuild. Do we have them? I wonder. Fundamental to being informed is being able to communicate freely, even (or especially!) those ideas which might be harmful, sub-optimal, or ultimately self-destructive. Love the rest of your commentary as well. Western Civilization is a wondrous achievement in human history, but even the best can be better. It seems to me that the almost automatic conference of moral authority on the successful is a dangerous development in an increasingly volatile economy based, more so than any other in human history, on quality (edit to add: or even just attractive!) ideas being pushed to the forefront of the public consciousness. The internet enables a rapid overhaul of human interaction, and there are trillions of dollars of wealth being generated by this sudden, rapid, ongoing revolution. It's important to be careful not to conflate economic (or, as you suggest vis-a-vis actors and the like, performative) success with probable quality in unrelated arenas. The probability that a great ballet dancer is also a great philosopher is likely no greater than the probability that a great farmer is a great philosopher. Why should it be any different for actors, computer programmers or the like? It's an interesting thing to ponder, and this dichotomy is one which has taken root in my mind recently as I scan the newsfeeds and see implied authority surrounding everyone with a modica of celebrity whenever they choose to speak on what are, fundamentally, philosophical issues. By my best count, Encarnacion is now 4-39 this spring, in all games, with one double. Can we please just: 1. Bench Him 2. IR him 3. Give him the boot. i know that he still has some bombs in him, a few. Even so, waiting for that to happen seems less and less likely to deliver us anything of real value before the trade deadline. Dipoto hit a bunch of trade homeruns this winter, but getting EE was not one of them. He isn’t going to help us much down the line ( in terms of youthful return) and he sure isn’t helping us now. EE has been sleepwalking in his initial weeks as a Mariner. If there was one adjective that captures his attitude so far, it is "disinterested." Now maybe that's his normal persona, I dunno. But he's not going to be traded to a contender unless he wakes up and starts, you know, playing. He has until Seager is back or maybe if one of Lewis or White pushes up. Jonez, this is a great piece. Prompts thought on important things--is there anything more worthwhile (especially these days)? I think your distinction is right on. When it bacame obvious that Zukerberg was no leader, he went out and got Sheryl Sandberg to fill that role. I'm working on a piece for my site that takes this kind of thinking and applies it to the upcoming presidential contenders. In case anyone's interested, I'll post a link here somewhere when it's posted in a couple weeks. By the way, for the record, I would not put Junior in the leadership catetory--he never filled that role. With Gar and Dan and Buhner he never needed to--and he probably wasn't equipped, anyway. But he was an exemplar par excellence. but my impression aligns with your assessment: that Jr. wasn't a 'leader' in the sense I'm outlining here. And *still* A-Rod sat behind him on the 'leadership' depth chart by a comfortable (or, for Alex, an *un*comfortable) margin. And yeah, Griffey was indeed an examplar on A-Rod's level (during his Seattle years). No dispute there. The tragedy of Jr's physical breakdown following his departure from Seattle is one of Greek proportions, and as a result he was essentially two players: the Seattle player, who was all-world and worthy of 1st overall selection in historical fantasy drafts, and the other guy who was an oft-injured cleanup hitter. I hope that the Jr. saga is one that all top shelf pro athletes take note of. Had he stayed in Seattle, and suffered the same injuries/breakdown he did in Cincy, who here honestly thinks that he wouldn't have found significant time at DH (pushing Edgar to 1B)? 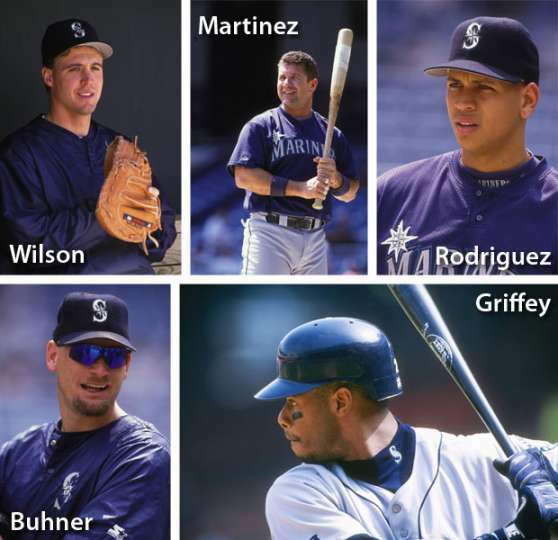 I'm not even suggesting that would have necessarily been *better* for the M's than what ended up happening, but it would have kept The Kid as the beating heart of Seattle sports throughout his career.